Cher may have sung about her desire to turn back time, but it was Ubisoft that made it a reality. 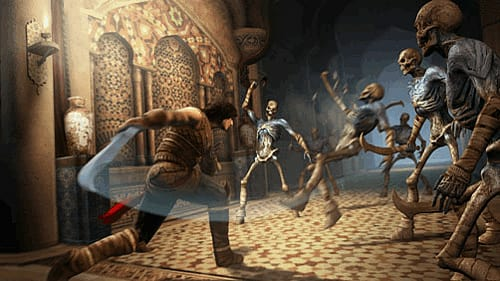 Now they're using the ability to rewind and restart to skip past the minor speedbump that was the rather easy 2008 Prince of Persia and restore the series to its roots. Roots, in this case, being the evergreen Sands of Time, which landed on PS2, Xbox and PC. Forgotten Sands is a sequel to that game, though you wouldn't know it. If you're worried that your lack of familiarity with a seven-year-old game will hold you back, don't sweat it - the debt is thematic rather than narrative, with visual style and controls carried over while the story follows its own path. 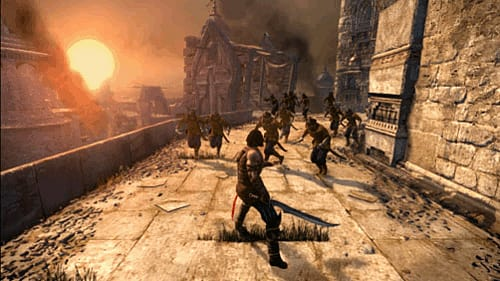 This being Prince of Persia, that path is likely to take you up, over, through and round a dizzying array of vertigo-inducing obstacle courses. You're dashing through a war torn Arabian palace, trying to save your brother from the evil influence of a gigantic demon, but the tissue-thin plot is really just an excuse to get you up and (free) running. Crisp control means you can throw yourself, literally, into the challenge with confidence, safe in the knowledge that the Prince's balance and aim won't let you down. The camera occasionally wobbles as it points the way ahead, but any frustration will come from your own sloppy timing rather than any technical stumbles along the way. Whether you're vaulting over deadly traps, or swinging to safety hundreds of feet above ground, simply clambering around the game's adventure playground levels is a joy in itself, and while the scenery never changes from start to end, everything looks and feels just right. And, of course, if you do make a fatal mistake, you can always reverse time a little and try again. The feature may be old and a little overexposed, but it remains incredibly useful. The repertoire of parkour-inspired moves is expanded with the rather brilliant ability to turn numerous water features solid at the press of a shoulder button. Turning waterfalls and fountains into pillars and walls, and back again, it opens up a clever new avenue for navigational puzzles, and tests your skills at timed button presses to the limit. The precision required perhaps gets a little too fussy in the final stretch before the obligatory big final boss battle, but any frustration is converted into elation when you finally master a tricky sequence. Combat isn't quite as inventive, falling back on the old hack-and-slash melee style popularised by God of War and Devil May Cry. The Prince doesn't have the same rich combo heritage to draw on, however, and with no block move the fights are reduced to tumbling away from enemies before battering the buttons to chop them into sand. At least you won't get lonely - the improved graphics engine means you can be facing upwards of fifty enemies at a time. Each monster destroyed earns you some experience, which in turn transforms into skill points that you can use to unlock and develop your stats, as well as four elemental magic powers. These leave fiery trails behind you, send waves of ice crashing forwards, summon tornadoes or encase you in stone armour. None are as impressive as you'd hope, even at their highest level, but they're effective enough at clearing a space during a massive ruck. 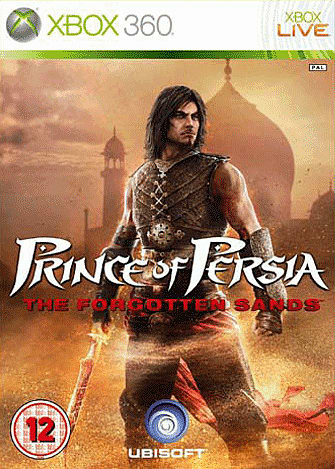 After the 2008 game, which often felt only loosely connected to Prince of Persia's long gaming heritage, this is an unmistakable return to form. Don't come looking for surprises or new ideas, but if you pine for the swashbuckling days of yore, a weekend in the Prince's company is still hard to beat. A return to form for a classic series. Later sections require a lot of patience. Slim story and dull characters. Nothing to do with the movie.